Rex Industries’ work with power substations has spanned decades. We fabricate all types of sheet metal enclosures and many of the components needed in coal-fired power plants. Many of our custom built enclosures can be found in Rocky Mountain Power’s substations throughout the Intermountain Region. Custom steel fabrication requires the ability to work with the customer using CAD drawings build-to-spec. 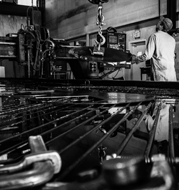 Shop production of custom fabricated products ensures a precise fit by using computer aided manufacturing in CNC plasma cutting, punch press, and press brake operations. As custom metal fabricators, Rex Industries uses galvanized steel, carbon steel, stainless steel, aluminum and other specialty metals. Other special materials can be researched and evaluated to meet customer requirements. Give us a call or submit a Request for Proposal to find out what we can do for you. See a complete list of our Services and Capabilities.